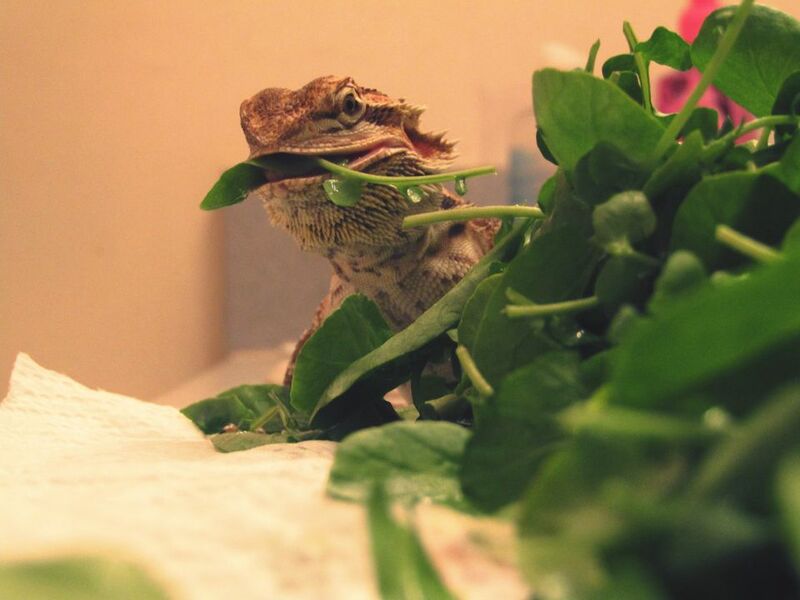 Adult bearded dragons need a variety of dark, leafy greens to eat on a daily basis. In addition to some crickets and other insects, these greens provide the vitamins and minerals they need to stay strong and healthy. Romaine, iceberg, red, and green lettuces should only be offered in small amounts (yes, spring mix contains some of these). They are primarily made of water and if large amounts of these lettuces are eaten your bearded dragon will most likely have diarrhea. On the other hand, if your beardie is dehydrated or doesn't have access to water for some reason it is great to feed these lettuces. Many bearded dragons develop preferences for certain greens and become picky when it comes time to eat. They may only want what isn't good for them, but that doesn't mean that's what they should live off of. When dealing with a finicky eater, continue to offer a variety of greens mixed up as a salad. If your beardie normally eats insects with no problems, try adding them to the salad to get his attention. If that doesn't work, you can also try adding small amounts of red fruits such as red raspberries or strawberries as "sprinkles" on top of the salad. The red color often draws his attention to his salad and may entice him to eat. Some people have had luck with adding in some colored bearded dragon pelleted food from the pet store. In addition to a variety of greens, your bearded dragon should get plenty of gut-loaded crickets and other insects, some fruits, and vegetables such as squash and bell peppers. Bearded dragon pellets are not recommended as a staple food but are okay to offer alongside the greens and other foods that are more natural than pellets. Adding a dusting of calcium powder to your dragon's salad a few times a week is also a good idea to make sure he is getting adequate amounts of the important mineral. Where Should You Purchase Crickets to Feed Your Pet?